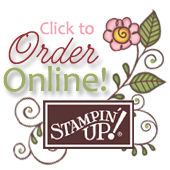 What's Up at Stampin' Up!? stamp set from the upcoming holiday catalog. Christmas Bliss- Who's ready for Christmas in July? 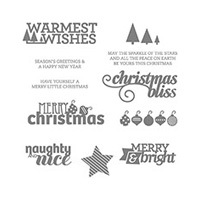 Meet one of our newest Limited Edition Photopolymer stamp sets-Christmas Bliss. 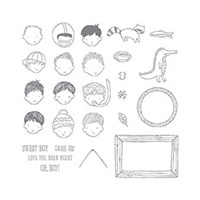 Dear Heart-Are you on the hunt for a cute boy stamp? Look no further. Indtroducing the Limited Edition Dear Heart Photopolymer stamp Set. same color), and provide your projects a more saturated look with blended colors. Little time for crafting? Paper Pumpkin kits are all ready to go! All pieces come ready to be assembled into 6-8 cards or other projects that you are sure to complete before the next month's package arrives. Don't have a lot of space? Paper Pumpkin contains only the amounts of materials to make its projects, plus a Stampin' Ink Spot and clear mount stamp set which store easily in one of our storage boxes. And you get a new color spot in each pack so you can collect your inks in small sizes! On the go? Paper Pumpkin comes in one box; throw in your scissors and adhesive and do your kits up anywhere...in the airport, at a hotel, on in a few captured moments at home. At the cottage for the summer? Paper Pumpkin can be delivered right to your cottage. Great way to occupy yourself on a rainy day! On a budget? Paper Pumpkin is an all in one solution. One One Regular Monthly Payment keeps you crafting! Or sign up for a Pre-paid Subscription to take advantage of savings. Don't get out much? Paper Pumpkin comes right to your door. Call a few friends in to assemble your kits together and call it a party! Love to craft with children or grandchildren? Sit down for some family fun and make the kits up together. Need a gift idea? Paper Pumpkin can be sent anywhere you wish... gift delivered and done! Who in your circle would love a little crafting time? 3/8" Stitched Satin Ribbon Share $11(plus $2 shipping if you are not able to pick up your share): This bundle includes 2 yards of each of the awesome NEW IN COLOR Ribbon!! This year's new In Colors are Blackberry Bliss, Hello Honey, Lost Lagoon, Mossy Meadow and Tangelo Twist… all fabulous! Get 10 yards of ribbon to show off these handsome hues. Email (robin@stampingcountry) your name and address to request your ribbon share. I will send a Paypal request when shares are ready.